An evening of music and talks in Swansea will aim to open up conversations around topics which many find difficult. 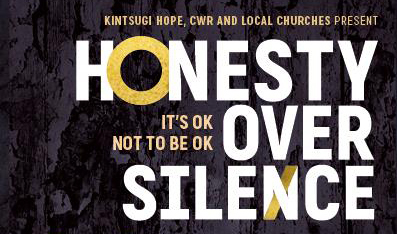 The Honesty Over Silence tour is arriving at St Stephen’s Church and will explore trusting in God when life is painful, dealing with anxiety and depression, learning to look after ourselves, developing our character, and living with thankful hearts even in tough seasons. It will examine the strength in letting go of the need to be in control, as well as looking at how we can stop comparing ourselves to others and instead live authentically and honestly as we grow into the people God has created us to be. The tour is the brainchild of Patrick Regan and singer–songwriter Diane Regan. Patrick is the CEO and Founder of Kintsugi Hope, and also founded urban youth work charity XLP. He has worked with some of the poorest communities around the world and regularly contributes to radio and TV on issues of poverty and justice. Diane has worked in both the corporate and charitable sectors and was a singer–songwriter and professional life coach. She is chair of the charity Christians in Entertainment and an ambassador for the popular national magazine Psychologies. 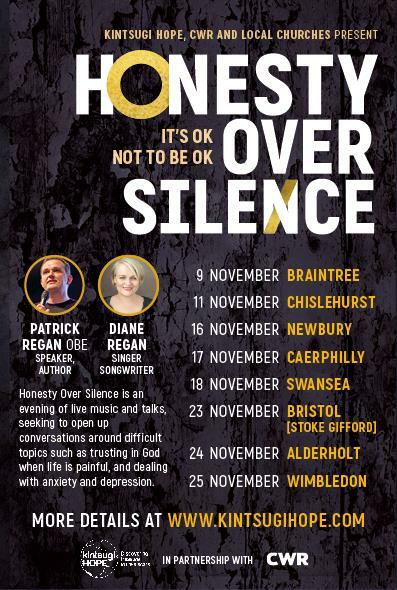 Patrick will be exploring themes from his latest book, Honesty Over Silence, and Diane will be performing songs around the theme of honesty, faith and hope. The tour arrives at St Stephen’s Church on November 18 from 6-8pm and entry is free. More details are available here. This was posted on 23 October 2018 and updated on 31 October 2018.